Are you fed up with your partner’s snoring and looking for a top quality device to cover this deficiency? If your answer is yes, then there is nothing to worry as the official franchise of the Telebrands has got one such product that will definitely help to cover this deficiency in an efficient manner. The name of this top quality product is 2 in 1 Anti-Snoring Device. The 2 in 1 Anti-Snoring Device is basically a revolutionary product designed to cover the problem of loud snoring with ease. 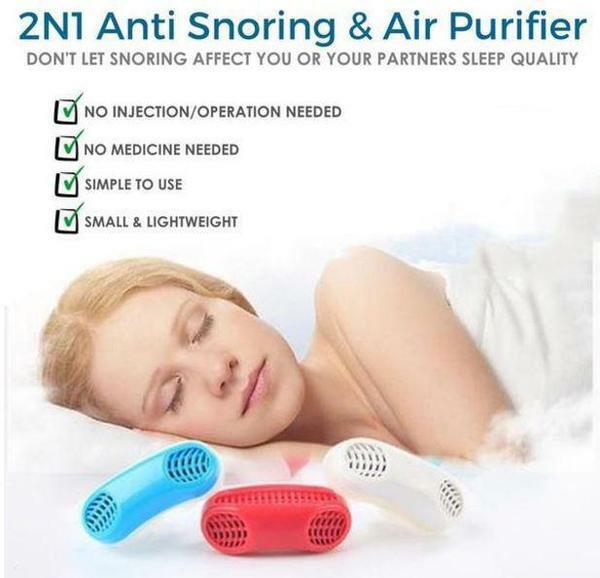 The 2 in 1 Anti-Snoring Device also features the dedicated air purifier that helps the user to always inhale the purified air during sleeping. The 2 in 1 Anti-Snoring Device is designed to stop the snoring of the person without disturbing the sleep of other users. The 2 in 1 Anti-Snoring Device helps to open the nasal passages of the user to maximize the flow of air that helps to reduce snoring. The 2 in 1 Anti-Snoring Device is FDA approved plastic device and it is totally free of Phthalate and BPA-. The comfortable design of the 2 in 1 Anti-Snoring Device helps to fit firmly in the nostril and it doesn’t need any type of holding device, as the same device will help to hold it. The 2 in 1 Anti-Snoring Device comes in several appealing colors as the Blue and White. Now you do not need to feel embarrassed in front of others due to your snoring habit, as the very same product will help you to achieve your purpose in an efficient manner. If you want to place an order of this product, then all you have to do is to just log on to the official website of the Telebrands PAKISTAN. Alternatively, you can also place your order just by dialing the number 0321.4115583 from your mobile or landline number.